Step-by-step homemade Pork Potstickers Recipe. Potstickers (dumplings) are really easy to make at home and are so versatile with the filling that can be used. These potstickers are filled with a ground pork, cabbage and mushrooms filling. 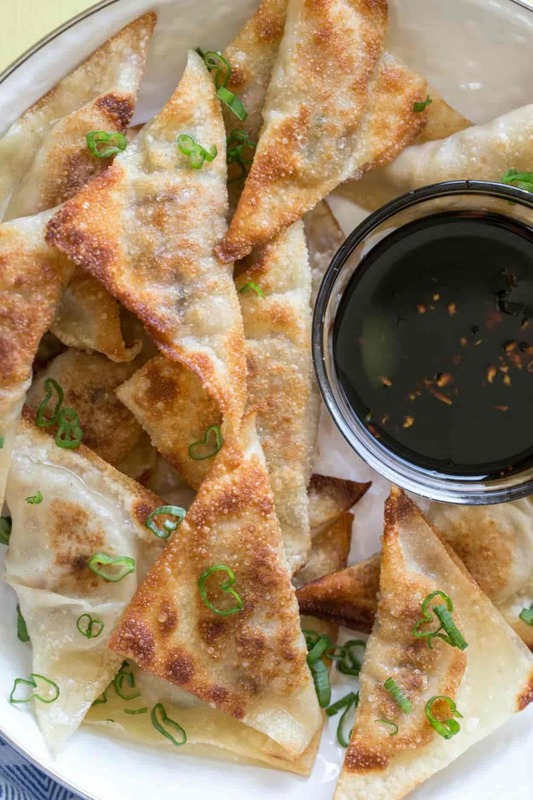 Potstickers are sometimes confused with gyozas. Though prepared slightly different, both are wonderful and so much better than takeout. Potstickers are Chinese dumplings that are also popular in Asia other Western countries. The dumplings are filled with a meat or veggie filling and pan-fried until brown and crispy. The recipe for these potstickers is great! Ground pork mixed with sauteed mushrooms, carrots and cabbage. The filling is secured in thin wrappers then fried until crispy on the outside and juicy on the inside. Though potstickers are a little time consuming, they are worth the effort. PREPARE FILLING: Saute mushrooms. Cook carrots and cabbage. Combine all of the ingredients for the filling. ASSEMBLE: Potstickers are so easy to assemble. Layout the wrappers. Spoon about 1 Tablespoon of filling to the center or wrapper. Moisten edges of wrappers with water and close to secure. COOK: Add oil to a skillet to cover pan. Once hot, add potstickers and fry until crispy on both sides, flipping as needed, about 2-3 minutes per side. SERVE: Serve potstickers with sauce and ENJOY! what do you serve with potstickers? Potstickers are best when served with a sauce for dipping. For the sauce we just used low-sodium soy sauce and freshly grated ginger. The potstickers are also great to serve with Kani Salad. Yes, potstickers are great to freeze. Layout assembled potstickers on a baking sheet lined with parchment paper. Once potstickers are frozen, transfer to freezer bag. Potstickers will stay fresh up to 3 months in freezer. To cook, add frozen potstickers to skillets per instructions, they will just need a little longer to cook at a lower heat. 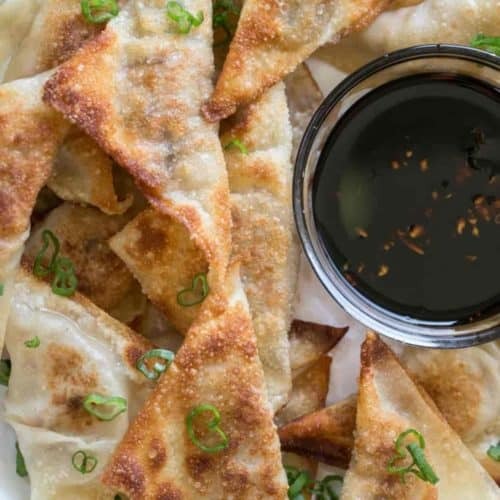 I can’t wait for you to give these homemade potstickers a try. They are wonderful and so easy to make. Uzbek Samsa Recipe– classic Uzbek dish. Spicy Chicken Quesadilla– easiest quesadilla recipe. Savory Crepes– ground meat and veggies, sauteed. Amazing potstickers recipe. 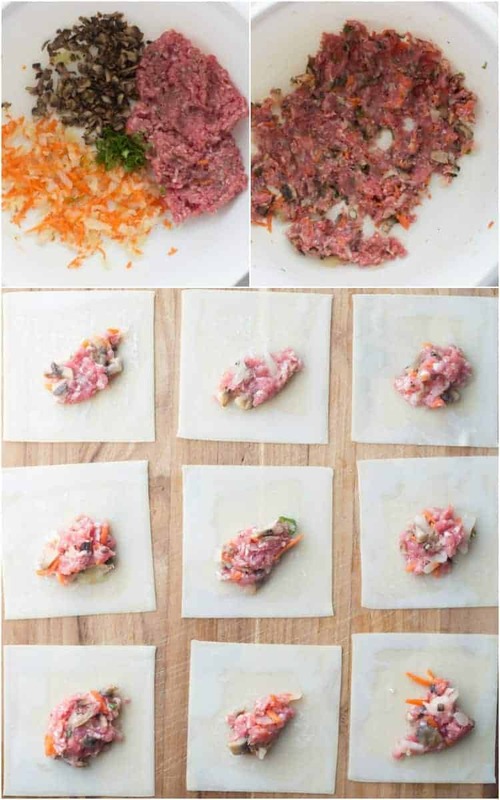 Wonton wrappers with a ground meat, cabbage and mushroom filling. The dumplings are pan-fried and so easy to make. Saute mushrooms in oil until golden. Add cabbage and carrot to saucepan, cover with water. Bring to a boil, cook 2-3 minutes until cabbage becomes tender. Drain water and squeeze excess water. Combine all of the ingredients for potstickers, add salt/pepper to taste. Lay out won top wrappers on the surface. Spoon filling into the center of the wrapper. Using fingers, moisten edges of wrappers with water. Fold dough over to create a triangle, pinch edges to seal, lightly push down on the filling to distribute filling for even cooking. Add enough oil to cover the bottom of the non-stick pan, heat oil over medium heat. 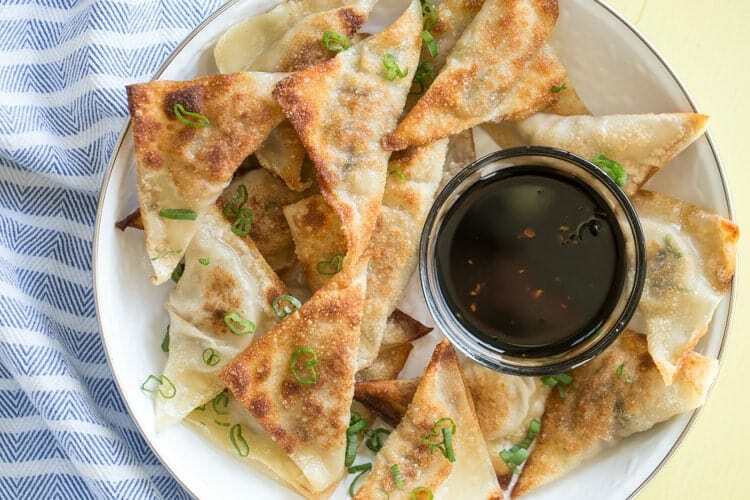 Cook potstickers in a single layer until golden crisp, about 2 – 3 minutes on either side. Enjoy with dipping sauce. You can also find this recipe on Julie’s Eats and Treats, where I shared the recipe first. Hi Valentina, they look really good. I make a similar recipe with a 1 package of 8oz cream cheese, 12 oz of imitation crab meat and 2 pouches of green onions. These look awesome! I’ve been looking for a good potsticker recipe, can’t wait to try! Thanks Rebecca, hope you enjoy them☺..
Yessss, love these! So happy to have found a quick fix for my random and frequent potsticker cravings. Cannot wait to try these! Ha! Yes, those potstickers cravings can be real?.. 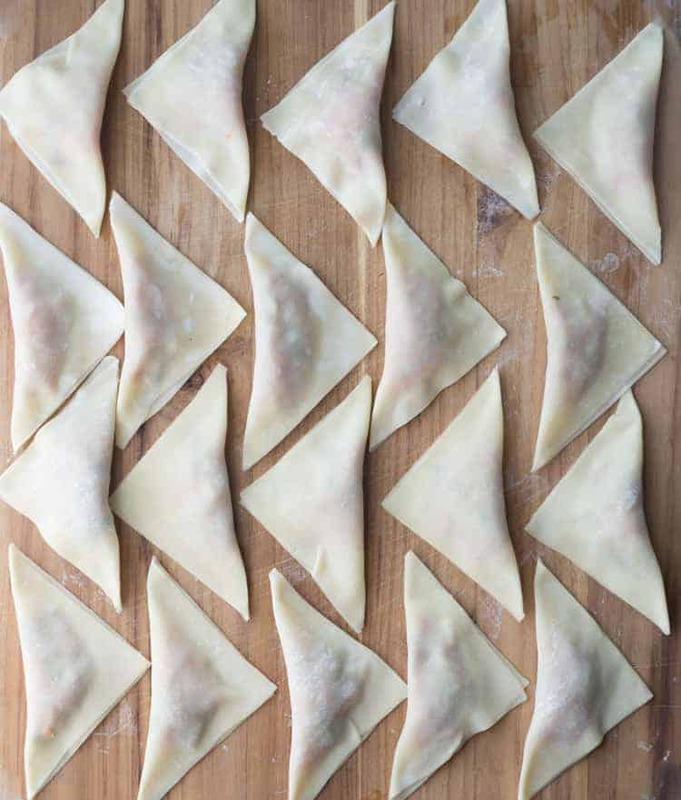 Hi Valentina,i really want to try out this recipe,but im wondering were do you buy wonton wrappers?..Is it the same thing as spring roll pastry sheets?